It was United’s 15th loss in 33 matches ensuring a campaign that had started in such encouraging fashion fizzled out completely. In the closing three months of action United only registered three wins which ensured the Tribesmen eventually finished the year in ninth place. Dundalk were dominant throughout the clash at the Louth venue scoring three times before the break, even though a Ryan Connolly goal for Galway, who improved after the restart, was a boost. 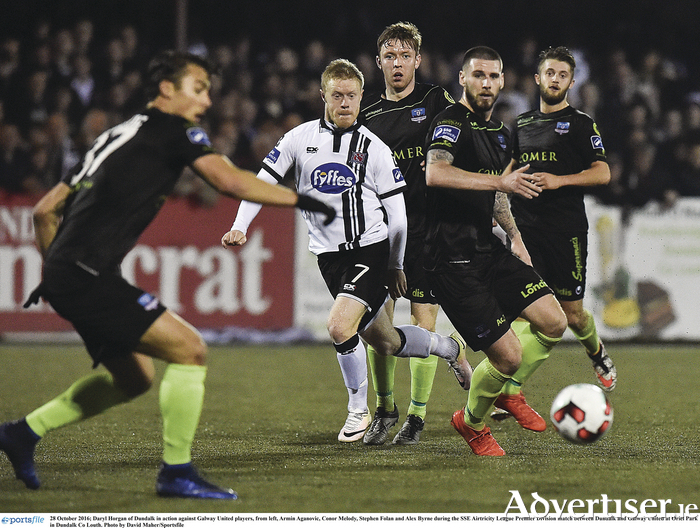 Stephen Kenny’s excellent Dundalk side were not overly concerned celebrating a third title in a row with a squad including Galwegians Alan Keane, Daryl Horgan, and captain Stephen O’Donnell. Finding a suitable replacement for Tommy Dunne, who was sacked at the end of September, is what the United board is currently striving to do. Johnny Glynn, who guided Galway to the decider of the SSE Airtricity League Under 19 competition, is a strong contender and possesses significant knowledge about the local game in the west. Glynn, who scored the winning goal for United in the 1991 FAI Cup final against Shamrock Rovers, showed a willingness to bring through young talent while in charge of Mervue United. Pat Hoban, Rory Gaffney, and Ryan Manning who are all now professional footballers in England benefited from Glynn’s guidance at Mervue and the manner in which several of the Galway under 19 side developed was impressive. Ian McParland, who had a spell as Notts County manager and Ipswich Town assistant manager, attended last month’s home game against Longford Town and has been linked with the role. Former Drogheda United, Athlone Town, and Bray Wanderers boss Mick Cooke is another name being mentioned in relation to the post which needs to be filled quickly in order to commence pre-season preparations. Vinny Faherty is the only current United squad member under contract for 2017 so whoever is chosen will need to act smartly in order to ensure players are retained. The first team will return to training in early January, but the next eight weeks carry huge importance off the field for United.